Dr. Lee Hunter received his undergraduate education from Vanderbilt University where he received a B.A. in Anthropology. He attended medical school at the University of Tennessee Center for Health Sciences in Memphis. Upon graduating medical school, he attended orthopedic surgery residency at the Campbell Clinic, ﬁnishing his training in 1997. He became affiliated with Mid-Tennessee Bone and Joint Clinic in 2002. Dr. Hunter received an MBA from the University of Tennessee in 2009. Dr. Hunter specializes in surgery of the hand and upper extremities. Dr. Hunter is from Selmer, TN, and his wife, Mary, is from Jackson. They have two children and reside in Columbia. 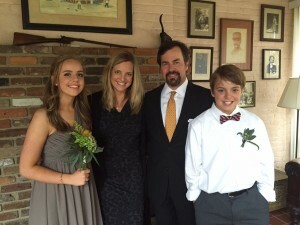 Dr. Hunter’s interests include spending time with his family and being in the outdoors. He has worked as a medical missionary in Zimbabwe and St. Lucia. Dr. Hunter is past President of the Tennessee Orthopedic Society, and has served as a Councilor to the American Academy of Orthopedic Surgeons representing the state of Tennessee. Dr. Hunter’s professional accomplishments include the invention and commercialization of a proprietary surgical arm positioner, used exclusively for surgery on and around the elbow. The ElbowLOC® Arm Positioning System simpliﬁes patient positioning for elbow surgery and lessens the time the patient is required to be under anesthesia for their given procedure. The device is used by orthopedic surgeons throughout the world and is featured in surgical textbooks and journals. Dr. Hunter holds multiple U.S. patents for his medical device inventions.